This list of Pilgrimage Site are the Verso Ministries Top Pilgrimage Sites in Region 2. The Regions that will be used for all of our lists are based off of the Regions used by the National Federation for Catholic Youth Ministry (NFCYM) and used for the Bishop Conferences. These resources are here for Youth Groups, Young Adults, and Individuals to be able to find local sites to go on Pilgrimage to. The National Shrine and Basilica of Our Lady of Victory was the vision of Father Nelson Baker after a fire in 1916 nearly destroyed the parish he was the pastor of. As the repairs began, he revealed to his parishioners that he wanted to rebuild the Church as a Shrine to Our Lady of Victory by bringing in some of the world’s greatest architects and artists to create a shrine on par with the greatest in Europe. Perhaps one of the most unique things about the Basilica is that it functions as both a Shrine for pilgrimage groups to visit as well as a parish for those who live in town, completing the vision of Father Baker. This is a special place to visit as it is easy to get lost amongst the statues and the stained glass. Be prepared to stretch your neck out after you spend fifteen minutes looking up at the interior of the dome trying to take in the magnificent artwork of Mary’s coronation in Heaven. This is truly a special place, and one that will fill any heart with love for Jesus and Mary. So I encourage you to spend some time just wandering around the Church, allowing yourself to be filled with awe and wonder at the works of art around you. Pray the stations of the cross on your own or with a group, attend Mass and Reconciliation at this holy site, and be filled with the peace that true beauty provides the heart. The National Shrine of Saint Kateri Tekakwitha honors the first canonized Native American. Kateri was a young Mohawk girl who with her uncle’s permission became a Catholic at the age of 18. She eventually made her way to a Catholic settlement near Quebec and worked with the elderly and children before succumbing to an illness and passing away on April 17, 1680. The Shrine was dedicated in 1980, but had been set as a place of devotion to Saint Kateri since 1938. It is on the grounds of the village that Kateri grew up in and allows pilgrims to walk with her on the same ground that she trod in her life, even containing the same spring that she was Baptized in. Saint Kateri is a special patroness to the Americas being one of the first canonized Americans as well as the first canonized Natives. While there you should definitely take the opportunity to pray through her intercession for miraculous healings as well as visit the museum that sheds more light upon her tribe that she grew up in. And when you wrap up your time at the Shrine, you should look into going just 6 miles down the road to the next Shrine on our list! The National Shrine of the North American Martyrs is located just ten minutes east of the Shrine of the aforementioned Saint Kateri Tekawitha. This Shrine honors the Jesuits who preceded Kateri in the evangelization of the Natives of New York and Canada, and is a remembrance of the blood that was shed for Christ in order to bring his Gospel message to the Americas. The Shrine itself is located at the place of initial contact between the Jesuits and the Mohawks (Kateri’s tribe) as well as the place where Saint Kateri was born. Visiting the Shrine provides an opportunity to learn about and honor the eight Jesuits who gave up their lives for the faith. While there, you can walk upon the ground that these Martyrs walked upon, even visiting the ravine in which St. Rene Goupil was buried in. There is also the unique opportunity as well to be able to admire the artwork from countries across the world and from multiple centuries. A more complete list of the artwork can be found at the Shrine upon arrival. However, the central piece of the Shrine is the massive Coliseum church built in honor of the Martyrs. For more information on the Shrine, you can go to the website and learn about all of the different places of prayer for on the campus. 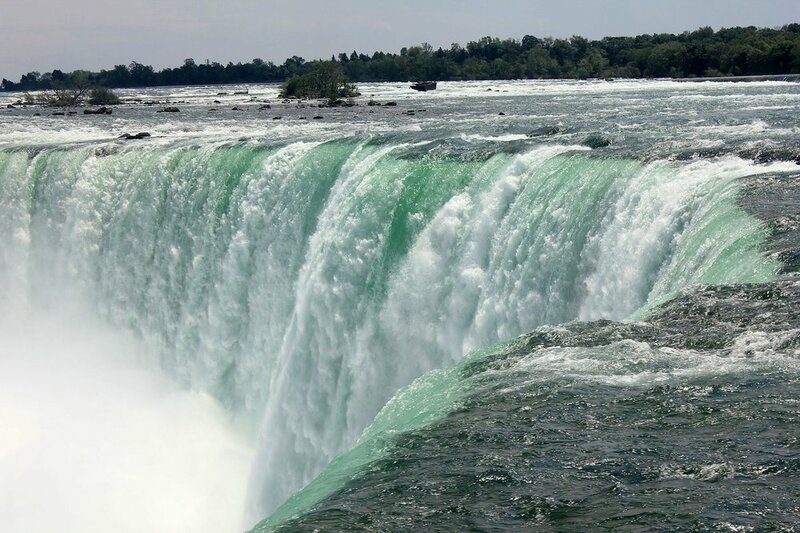 Niagara Falls is perhaps one of the most famous natural wonders in the United States of America. The power of God can be seen within this place as at the first sight of the Falls can only invoke a recognition of the awesomeness of Creation. Personally, I was moved by the experiences of standing on top of the falls and then going underneath them on boats. There is something about water that brings about a remembrance of our own Baptism and Niagara Falls does not fall short of this. The town itself is also home to some great restaurants and other fun activities for youth groups and young adult groups so check out the website for more information on it all! Saint Patrick’s Cathedral is a hallmark of Catholicism for anybody who grew up anywhere within the Five Boroughs of the City. Even those of us from across the river in New Jersey look to Saint Pat’s as the central hub for Catholicism in the region. With the cornerstone being put into place in 1858, and the funds being raised by the parishioners (mostly poor Irish immigrants), the Cathedral is a true labor of love that all who attend it can look at with confidence as they say, “we built this”. While there, take part in one of the guided tours provided by volunteer tour guides or even give yourself your own tour and walk around the Church on your own. There are at least five daily Masses a day so plan your trip accordingly so you can attend one of them! And when you wrap up your time at the Cathedral and head out the door, you will find yourself only a short walk away from both the Rockefeller Center and Times Square, not to mention being less than a mile from the southern portion of Central Park! The next time you find yourself in New York City, make sure to make a pilgrimage to this holy site amidst the other landmarks in town.